A bad timing belt can’t go neglected—it can ruin your engine. Since the timing belt is responsible for “timing” your engine’s movements (namely, the timing belt operates the camshafts which cause valves on your engine to fire), a disruption can cause engine misfiring. What’s worse, misfiring can lead to major, irreparable damage to your engine (more about that below). Now, if you suspect that you have a problem with your timing belt, you may have more than one question on your mind. Here are a few of the most common questions we encounter here at Avalon Motorsports, your German auto repair shop, as well as all of the answers you need. Your timing belt controls your vehicle’s camshaft. The camshaft is responsible for opening and closing valves in the engine. These valves cause the engine to fire, moving your engine’s pistons, which generates the power that turns your wheels. What are signs of a bad timing belt? Timing belts are made of rubber (although heavy-duty vehicles often have metal timing chains). Now, rubber fails over time, especially when it’s put under the heavy demands of an engine. The rubber of your timing belt can stretch, causing mistimed firing in your engine. In addition, the teeth of your timing belt can snap off or skip, which also causes engine misfiring. At worst, your timing belt could also snap completely (more about that next). If your timing belt isn’t causing smooth firing in your engine, you could see plumes of exhaust, you can experience loss of power, and your vehicle may not start as easily as it used to. If you see plumes of smoke, it could be due to the fact that your engine is burning gas efficiently, since the camshaft isn’t turning with perfect consistency. If you notice a loss of power, you may have a timing belt that is slipping or stretched out, which will slow your camshaft. And if your vehicle isn’t starting up as it should when you turn the key, your timing belt may not be engaging the crankshaft to get your pistons firing right off the bat. What happens if my timing belt snaps? 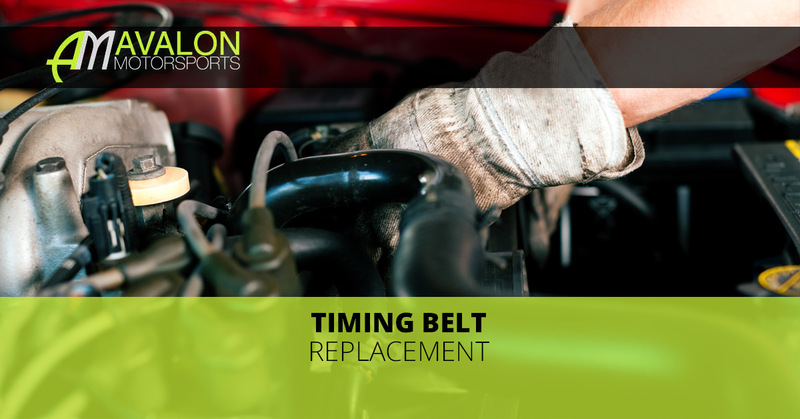 Unfortunately, if your timing belt snaps, irreversible damage can be caused in a matter of seconds. If your engine is running at all while your timing belt snaps (which is really the only time a timing belt will snap), then your valves can remain open too long, and your pistons can slam into open valves—that can be enough damage to total your engine. In addition, you can damage your cylinder heads, as well as the camshaft, among other engine components. In short, a snapped belt is just something to avoid. A snapped timing belt can cause thousands of dollars worth of damage to your engine. How much will a new timing belt cost me? Well, that depends on the make and model of your vehicle. However, on average, a timing belt replacement will be a few hundred dollars. You can expect to pay $500 to $900 for a timing belt replacement. Timing belt replacements are relatively expensive, in comparison with other preventative maintenance, simply because the engine must be disassembled and reassembled to a degree, making timing belt replacement a time-consuming process that requires a highly skilled mechanic. Most vehicle manufacturers recommend replacing the timing belt every 60,000 to 90,000 miles—consult your owner’s manual for the best advice. If you notice any of the signs we mentioned above, it may be best to bring your vehicle into the shop. Unfortunately, since the timing belt is buried within the engine, the engine must be disassembled even just to view the belt—you can’t determine the health of timing belt without a bit of serious digging. We can check your timing belt, and we’ll replace it if it has any damage. For timing belt replacement on German-made vehicles, come to our shop here in Denver. We provide timing belt replacement services and other auto repair services for Audi®, BMW®, Volkswagen®, Porsche®, and Mini® autos. If you’re ready to get your car up and running as it should, you can schedule service today!